Originally from the United States, Kristen Huebner now bases her musical life in the Netherlands and Europe. Kristen holds degrees from the Utrecht Conservatory (BM) and The Royal Conservatory of The Hague (MM), where she studied baroque flute with Wilbert Hazelzet & Kate Clark. This article is an adaption of the research done for her master’s degree in The Hague. 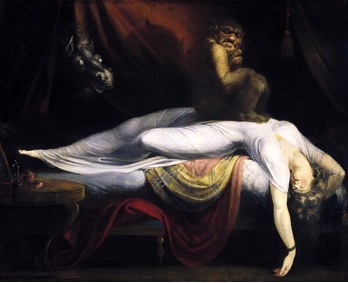 Henry Fuseli: The Nightmare (1781). As an avid performer of the chamber music of Carl Philipp Emmanuel Bach, who is often dubbed the ‘father’ of Empfindsamkeit in music, I have encountered works that surprised and demanded of me a more explicit and contemplative approach in order to execute with any real consciousness or effect. Trained as an historical flute player, I found that my existing strategies in making sense of the musical text and conveying that convincingly to an audience were severely lacking when confronted with this new style. Such a unique music seemed not to correspond to a ‘broader’ style associated with the typical German baroque music I had previously encountered. Indeed, Bach’s quartets are unusual in more than one sense. They may be seen as ‘condensed symphonies’, as he essentially recreates a symphonic texture with the keyboard taking central importance in the small ensemble. Perhaps most taxing for the performer of these quartets is the abruptness with which one must make changes in mood and character; drastic intervallic leaps, modulation to strange keys and an intentional disruption of the rhythmic pulse all contribute to a sense of impulsiveness, the suggestion of something which cannot be predicted. The artistic phenomenon Sturm und Drang, which swept through Germany’s cosmopolitan centers from around 1770, corresponds quite richly to the aesthetic shifts occurring not only in music but in other disciplines of the day. Having its origins in literature and philosophy, the movement represented an artistic struggle to show the depths and extremes of the human experience via one’s expressive devices. The Sturm und Drang influence may be recognized in most artistic disciplines, including poetry, theatre, painting (exemplified by the works of Henry Fuseli, see above) and even landscape design, yet striking deepest in its most ambiguous and indefinable arena, music. Here, both Sturm und Drang and Empfindsamkeit, or Empfindsamer Stil, are used as general descriptors. But what is the origin behind these terms and how could an understanding of their distinctions benefit one’s musical interpretation and performance? Can Empfindsamer qualities exist musically? If so how are they identified, and what are the musical tools available to musicians who want to perform this music according to these aesthetic ideals? This article begins with an examination of the treatment of the terms Empfindsamkeit and Sturm und Drang respectively, and continues with an exploration of their musical expression and characteristics in the quartets for keyboard, flute, viola and bass by Carl Philipp Emmanuel Bach. The term Empfindsamkeit is primarily known as a reference to a sentimental style of writing developed by Friedrich Gottlieb Klopstock (1724–1803) around the middle of the eighteenth century, after his publication of Odes set off a frenzy of emotional fervour. In the introduction to his volume on the topic, David Hill explains how ‘writers in the sentimental style … had a preference for an ecstatic and elevated but rather abstract tearfulness’.1)David Hill, ‘Introduction’, in David Hill, ed., Literature of the Sturm und Drang (Rochester: Camden House, 2003), p. 6. Catherine Minter’s thorough essay Literary Empfindsamkeit and Nervous Sensibility in Eighteenth-Century Germany reveals a more complex underpinning to the term Empfindsamkeit, or rather more specifically Empfindsamer behaviour.2)Catherine J. Minter, ‘Literary “Empfindsamkeit” and Nervous Sensibility in Eighteenth-Century Germany’, The Modern Language Review, 96/4 (2001), pp. 1016–28. Taking a humorous account from Karl Philipp Mortiz’s Magazin zur Erfahrungsseelenkunde regarding a man ‘who is empfindsam to excess’, Minter relates to us that a person afflicted with Empfindsamer qualities is, no doubt, not to be envied: ‘A character who suffers from a nervous disorder begins to take on the traits of a person who is unhealthily empfindsam: misguided poetic inclinations and an exaggerated desire for friendship and (sexual) love’.3)Minter, ‘Literary “Empfindsamkeit”’, p. 1018. … contain profound and clever ideas, a somewhat free treatment of the parts … an apparent disorder in the melody and harmony, strongly marked rhythms of different types, robust melodies and unison passages, concerting middle voices, free imitations of a theme (often in fugal style), sudden modulations and digressions from one key to another that are all the more striking the more distant their relation, strong gradations of loud and soft and especially of the crescendo, which when used in conjunction with an ascending and swellingly expressive melody, is of the greatest effect.4)Johann Georg Sulzer, ‘Allgemeine Theorie der schönen Künste’ (1771–74), in Nancy Kovaleff Baker and Thomas Christensen, eds., Aesthetics and the Art of Musical Composition in the German Enlightenment: Selected Writings of Johann Georg Sulzer and Heinrich Christoph Koch (Cambridge: Cambridge University Press, 1995), p. 106. Whereas Empfindsamkeit seems to be used as a general term referring to a vast spectrum of emotional possibilities, the term Sturm und Drang5)An initial search for direct translations brings us face to face with a possible re-translation of the word ‘Drang’. Max Rudolf, in Storm and Stress in Music (Berea, OH: The Riemenschneider Bach Institute, 1994) suggests that it could mean instead ‘urge’ or ‘yearning’, which gives a more vivid Picture. Indeed, the ‘Drang’ of Sturm und Drang is the more puzzling of the two, not only because of this possible double, or triple, meaning but also because of the overtly subjective connotation of the offered translations. As opposed to ‘Sturm’, ‘Drang’ suggests something internal, an intimate yet persistent desire, which either cannot be expressed, making it even stronger, or finds its release in rather irrational and inexplicable ways. emerged as a label for the German literary movement occurring during the late eighteenth century (roughly 1770–77),6)Roy Pascal, The German Sturm und Drang (Manchester: Manchester University Press, 1953), p. 5. which focused on individual expression and subjectivity. The writers articulated clearly the frustration with artistic restrictions and the desire to break free of the norms established by the Enlightenment mentality. Around 1770 a young, spontaneous and emotionally involved group of intellectuals, writers and philosophers sprouted up in the regions of Strasbourg and Frankfurt, spearheading an intense spurt of creative literary discourse. This group was led by the soon-to-be literary celebrity Johann Wolfgang von Goethe (1749–1832), a fresh-faced and vigorous writer whose poetry and prose alike had insured his place in contemporary stardom. Propelled by the vigour of youth and a binding sense of brotherhood, this testosterone-fuelled crew inherently amassed a nervous and emotional energy, prone at times to (metaphorical) violence, which manifested itself both in real-life and on the page.7)Pascal, The German Sturm und Drang, p. 5. Taking the lead from the Enlightenment raging throughout Europe, the Stürmer und Dränger could not help but be influenced by their changing world. However, for them there were limits to this new ideology. Its heavy predominance on man’s reason as a means of liberating the Self seemed rather restrictive. As a result, we read in the works of Goethe and the other writers a particularly murky moral ground. Because the conflicts of the characters the authors write about are so intertwined, it becomes nearly impossible to take a simple stance for or against them. In a way they become more human, flawed and unable to escape their true nature. Indeed, their conflicts and struggles become so complex that one’s judgment of them becomes more empathetic than accusatory. One-sided simplicity was no longer an option for interpretation by readers. Directly studying the works of Carl Philipp Emmanuel Bach, one finds symptoms of individual expressionism and startling musical characteristics essential to the Empfindsamer Stil springing up well before the writers of the Sturm und Drang had even reached puberty. Perhaps the most beautiful articulation of the essence of Empfindsamkeit comes from William J. Mitchell, who wrote the introduction to the English translation of Carl Philipp’s Versuch über die wahre Art das Clavier zu spielen. He emphasizes that at this time the means by which one expressed oneself was equally important as to the content being delivered. Music here was far removed from a decorative art, from abstract patterns of sound; it was, above all else, a vehicle for the expression of the emotions. Music must languish, it must startle, it must be gay, it must move boldly from one sentiment to another; these were the requirements that had to be met by the composer. And the performer must understand the true content of each piece that he played. He must transmit accurately and faithfully its expressive nuances to an audience whose heart must be stirred.8)William J. Mitchell, ‘Introduction’, in William J. Mitchell, trans. and ed., Carl Philipp Emmanuel Bach’s Essay on the True Art of Playing Keyboard Instruments (New York: W.W. Norton, 1948), p. 14. As can be assumed with all things overtly emotional, this ‘sentimental’ style enjoyed but a brief period of success, the idea of showing too much emotion in public later becoming passé, a laughable notion. But for the moment when it existed in its appreciated context, it represented both a connection to its roots of rhetoric and a break with its often stringent execution. Rather than relying solely on intellect to guide moralistic behaviour, the Empfindsamkeit, as it pertains to the music of this era, focused rather on an immediacy of expression and emotional response. Carl Philipp Emmanuel Bach, as the son of his father Johann Sebastian, can easily be seen as the prime example of these shifting aesthetics. Along with his service at the court of Frederick II of Prussia (1738–68), which offered him the perfect platform to display himself both as a composer and a performer, Carl Philipp’s Empfindsamer ideas can also be found in his Versuch of 1752. This volume offered not only an instructional method for aspiring keyboardists but also spread his Empfindsamer ideals and manner of style throughout Europe.9)Major composers of the following generation have testified to their debt to Carl Philipp; Mozart bent a knee when he claimed that ‘he is the father, we are the children’ and Haydn followed suit when he described the essay as ‘the school of all schools’. One telling story deals with Beethoven’s acquisition of the pupil Czerny; after accepting him as his student, he told his father to purchase Bach’s Versuch, which was used arduously throughout his study with the great genius-composer. See Mitchell, ‘Introduction’, p. 2. The most obvious change that comes to mind in the world of music during this time is the gradual development of instrumental roles. Let it be noted that it is no coincidence that the title of this set of quartets was expressly stated with keyboard first in the list of instruments, as opposed to the indications for his trio sonatas, which list the upper voices first in their standard order. Bach’s meaning could not be clearer; the keyboard is meant to take centre stage. This isn’t a surprising notion, especially considering Carl Philipp’s fame on the clavichord, but thrown into the context of a chamber music setting including flute, viola and bass, it suddenly becomes something new and challenging. Instead of conforming to the basso continuo function of the keyboard, its texture is symphonic in character. Often, the keyboard rises to the role of the voice of content (melody), while the other instruments work together to form the harmonic foundation. As a result, the so-called ‘melody’ instruments now carry the role of harmony and support the texture in a function they were not so often accustomed to previously in the eighteenth century. In this sense, the orchestral accompaniment was brought into a chamber music setting. One of the most poignant examples of the shifting roles of instrumentation from the quartet series is the slow middle movement from the Quartet in G Major, Wq. 95. It is here that we see a movement almost entirely focused on the melancholia of the keyboardist and the dialogue corresponding between the flute and viola in response. The flute and viola lay the foundation with the opening two bars of introduction, the piano sticking to its traditional role in the background, until it bursts to the fore with the upbeat to bar 2. Though the flute and viola will exchange passages suggesting the hope of optimism to the soloist, we find in the chromatic urgency and the intervallic leaps a kind of stubborn insistence of mood. Just as with a Sturm und Drang protagonist, one cannot predict what comes next. Figure 1 C.P.E. Bach: Quartet in G Major, Wq. 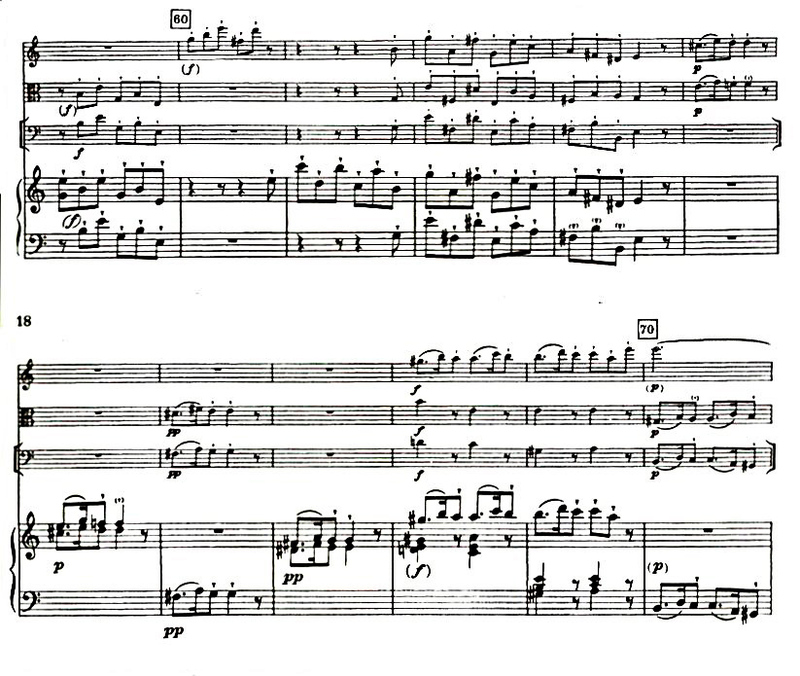 95, ‘Adagio’, bars 1–2. In the first movement of the Quartet in G Major, for example, we are immediately thrown into an unknown sound world wrought with syncopations distorting one’s sense of rhythm and pulse. Slurs, even embellished with trills, are placed consistently in the ‘wrong place’ – on the lightest part of the beat. Such activity suggests a flurry of movement reminiscent of many of his symphonic works. Figure 2 C.P.E. Bach: Quartet in G Major, ‘Wq. 95, Allegretto’, bars 1–4. This same movement shows a wonderful example of the flute and viola shifting to the harmonic role. As the keyboard assumes a more independent position, they sustain the harmony in long tones floating above the texture. Figure 3 C.P.E. Bach: Quartet in G Major, Wq. 95, Allegretto’, bars 56–62. When it comes to some basic yet crucial issues of attack and character of the style, the list could stretch quite far. For the purposes of this survey, however, I have limited myself to examples of rhythmic manipulation and dynamic juxtaposition. By constantly playing with rhythmic cohesion, Bach is tampering with his audience’s level of trust in him. The listener can no longer predict the course the musicians will take, just as one could never fully place one’s full trust in the protagonist of a Sturm und Drang novel or play since they were often prone to follow their inner troubles rather than socially accepted forms of reason and restraint. The playfulness of accent markings showing up on the weak note of a bar (e.g. beat 2 of a 3/4 movement) or perhaps the intervallic leaps to the upper register which happen at inexplicable moments challenge the old adage of hierarchy of the bar as a sacred principle. The Allegro di molto in the Quartet in D Major, Wq. 94 represents the kind of sprightly energy evoking many of the characteristics described by Sulzer above. We can see from bars 84 to 93 already a strong interruptive motif passed throughout the ensemble. By using rests in unpredictable places, our sense of pulse becomes distorted and a feeling of urgency instilled. Notice that in bar 96 the tutti forte comes as an absolute surprise after we have heard the longer version (the equivalent of bars 87–89 is eliminated the second time). Figure 4 C.P.E. Bach: Quartet in D Major, Wq. 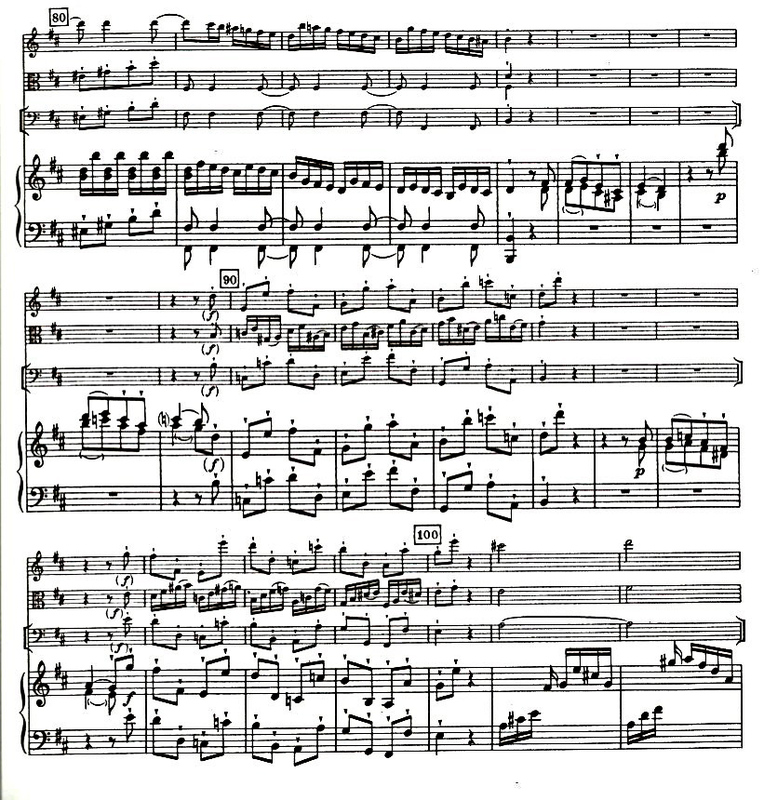 94, Allegro di molto’, bars 84–100. Not only through rhythmic surprise are we thrown into an unpredictable Sonic sphere. The dynamic range found in these quartets is enhanced by their quick juxtaposition from very soft to especially loud. Even the sheer number of dynamics present in the score represents the shift in musical notation; the dynamics have a character and their placement is vital. The shifting of accent markings and the number and function of syncopations is explicitly indicated in the score, making the task of performing these works all the more enticing. It is most often in the developmental sections of Carl Philipp’s music that we find the most contrast, as if he is fusing all of the musical ideas together towards one final statement. 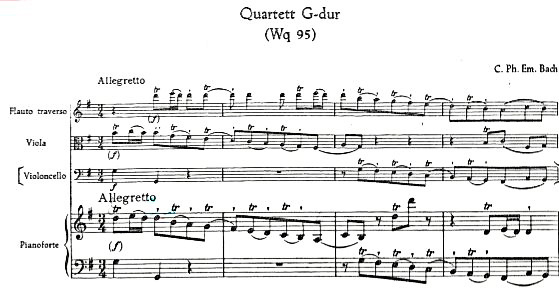 One example of how he uses the juxtaposition of soft and loud dynamics to create the utmost contrast is in the final movement of the A minor Quartet, Wq. 93 (see figure 5). In the development of the already very lively dotted rhythm motif, Bach takes us from piano to pianissimo and startles us with a tutti forte in bar 68. Notice as well the completely antithetical subito piano immediately afterwards in bar 70. The effect is one of being played with – the listener has no idea what is coming next but somehow doesn’t mind! Figure 5 C.P.E. Bach: Quartet in A Minor, Wq. 93, ‘Allegro assai’, bars 60-70. 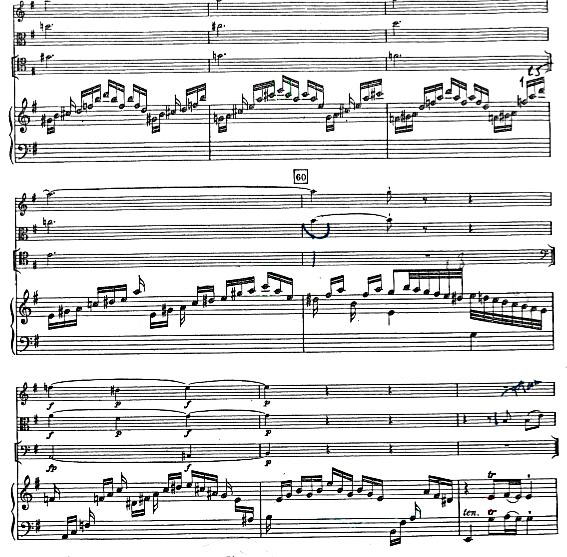 Modulation and a certain defiance of common rules in regards to the practice are one outstanding characteristic of Carl Philipp’s free fantasias. Of course we see trace elements of tricky modulation in the quartets. Standard harmonic progressions are often avoided, wiping the slate clean for the ears of the listener to be transported. Musicologist Annette Richards argues that ‘built into the metaphorical language used to describe this kind of harmonic adventuring is a notion of space, of distance – more specifically, the topography of harmonic experiment is conceived as landscape … its harmonic digressions and round-about routes pictured as twisting paths winding across varied scenery’.10)Annette Richards, The Free Fantasia and the Musical Picturesque (Cambridge: Cambridge University Press, 2001), p. 40. For the performer of these works, the antithetical ‘problems’ one encounters in the text should be seen as an invitation to explore rather than dilemmas to be sorted out. Understanding that this specific time in music is characterized by the rapidity and abruptness of movement, we must allow ourselves to be open to (re)interpretation on another level. The idea is not to ‘even out’ the contrasts and quirks of this music but to display them just as blatantly as they appear. All of these examples point to one resounding conclusion: that the Affect of these works must be constantly varying. It is music intent on surprise, a willful trickery of rhythmical hierarchy built on instrumentation uncommonly used in the eighteenth century up until this point. The desired rapidity of changes in mood is confirmed by Carl Philipp’s instruction to the performer: ‘constantly varying the passions he will barely quiet one before he rouses another’.11)Mitchell, trans. and ed., Essay, p. 152. Perhaps it will aid our musical imagination to draw a brief aesthetic comparison between these musical examples and the literary movement of Sturm und Drang. A summation of the characteristics of this style of writing may help to shed further light on the general paradigm shift that took place in Germany’s cultural identity as a result of this disillusionment with the ideas of the Enlightenment. The Stürmer und Dränger inadvertently began to compose their own criteria for the elements of a good literary work and its protagonist. Diametrically opposed to the idea that heroes, or rather protagonists, should be morally superior, the Stürmer und Dränger wrote about characters whose moral compass was significantly flawed. They wrote of the common man rather than the aristocracy. This bold stance pushed against the common belief that the upper echelons of society were the desirable candidates not only for the central role in a work of fiction but also in the ranks of society in general. Simultaneously, the Stürmer und Dränger became obsessed with the idea of genius, changing their view of themselves as creators of artwork with an emphasis on the sublime. In order to get closer to the divine (whether it be to God or one’s own source of inspiration, i.e. genius), it was believed that one’s association with nature and the purity associated with it were of paramount importance. The aim of the Stürmer und Dränger was to develop a new emotional language to describe human experience. The conscious decision to walk away from certain established rules is, in fact, a powerful artistic statement. This is what the two worlds of music and literature have in common: their goal of a new emotional language, in both the literal and metaphorical sense, as a means to portray and express the human experience in a more truthful, yet not necessarily more beautiful, light. When I first began this exploration, my approach to these quartets and this repertoire in general was severely limited. By confronting the musical factors involved in this particular style of music, I was also forced to be pragmatic, making lists of musical tools at my disposal (instrument choice and awareness of changing roles, method of articulation like length and character of attack, and a new-found sense of accompaniment), forming definitions for myself and delving into cross-disciplines in order to understand just how to play it. Seeing things from the keyboardist’s perspective helped to broaden the scope of my own playing, realizing that my role in the ensemble was equal parts melody and honorary harmonic support. The art of accompaniment was then also part of my task, choosing colours and dynamics that blended better into the fortepiano. Annette Richards supports the idea that certain quirks are in fact used intentionally as affects, jolting but also exciting performer and listener alike. In reference to the genre most often associated with this freedom of musical exchange and experimentation, Richards’s comments on Carl Philipp’s free fantasia are indispensable for understanding this new style: ‘A music of continuous invention rather than elaboration, the fantasia consists of an effusion of ideas, one that is not chaotic, but deliberately fails to follow conventional patterns’.12)Richards, The Free Fantasia, p. 39. Playing explicitly what is asked dynamically, rhythmically and harmonically offers sometimes a more obvious and satisfying result than trying too hard to ‘prepare’ the sudden shifts in the music. Since there is so much that seems not to have much sense (deliberately lacking coherence), I found it best to trust the text and allow the overall result to form as a consequence of this direct text reading. In doing so I found these flawed characters and an overtly emotional response in the layering of musical elements. In our confrontation with sudden shifts and contrasts, the overall search should still be for the protagonist in the music, adding an element of drama and storytelling to this sonic art form. In this way we can get closer to Empfindsamer notions in our own performance. It would be untrue to say that my research did not create more questions than it answered. But finding answers is not the sole, or even the main, aim of such work. Rather my research enriches the experience of rehearsing, studying and performing these works. I have stopped searching for an ultimate meaning; there is no such thing. Rather, the accumulation of knowledge that results from my research is stored in my ‘musical tool box’, and helps me develop my own playing, programming and further research. The realization that this is an ongoing process, one with perhaps no end, is both comforting and gratifying. 1. ↑ David Hill, ‘Introduction’, in David Hill, ed., Literature of the Sturm und Drang (Rochester: Camden House, 2003), p. 6. 2. ↑ Catherine J. Minter, ‘Literary “Empfindsamkeit” and Nervous Sensibility in Eighteenth-Century Germany’, The Modern Language Review, 96/4 (2001), pp. 1016–28. 3. ↑ Minter, ‘Literary “Empfindsamkeit”’, p. 1018. 4. ↑ Johann Georg Sulzer, ‘Allgemeine Theorie der schönen Künste’ (1771–74), in Nancy Kovaleff Baker and Thomas Christensen, eds., Aesthetics and the Art of Musical Composition in the German Enlightenment: Selected Writings of Johann Georg Sulzer and Heinrich Christoph Koch (Cambridge: Cambridge University Press, 1995), p. 106. 5. ↑ An initial search for direct translations brings us face to face with a possible re-translation of the word ‘Drang’. Max Rudolf, in Storm and Stress in Music (Berea, OH: The Riemenschneider Bach Institute, 1994) suggests that it could mean instead ‘urge’ or ‘yearning’, which gives a more vivid Picture. Indeed, the ‘Drang’ of Sturm und Drang is the more puzzling of the two, not only because of this possible double, or triple, meaning but also because of the overtly subjective connotation of the offered translations. As opposed to ‘Sturm’, ‘Drang’ suggests something internal, an intimate yet persistent desire, which either cannot be expressed, making it even stronger, or finds its release in rather irrational and inexplicable ways. 6. ↑ Roy Pascal, The German Sturm und Drang (Manchester: Manchester University Press, 1953), p. 5. 7. ↑ Pascal, The German Sturm und Drang, p. 5. 8. ↑ William J. Mitchell, ‘Introduction’, in William J. Mitchell, trans. and ed., Carl Philipp Emmanuel Bach’s Essay on the True Art of Playing Keyboard Instruments (New York: W.W. Norton, 1948), p. 14. 9. ↑ Major composers of the following generation have testified to their debt to Carl Philipp; Mozart bent a knee when he claimed that ‘he is the father, we are the children’ and Haydn followed suit when he described the essay as ‘the school of all schools’. One telling story deals with Beethoven’s acquisition of the pupil Czerny; after accepting him as his student, he told his father to purchase Bach’s Versuch, which was used arduously throughout his study with the great genius-composer. See Mitchell, ‘Introduction’, p. 2. 10. ↑ Annette Richards, The Free Fantasia and the Musical Picturesque (Cambridge: Cambridge University Press, 2001), p. 40. 11. ↑ Mitchell, trans. and ed., Essay, p. 152. 12. ↑ Richards, The Free Fantasia, p. 39.